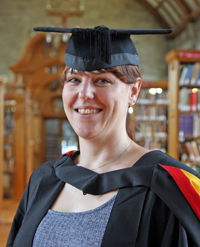 Darleen JonesInspired by a government schools inspector to pursue higher education, a mother-of-two childcare practitioner has successfully combined family life and full-time study to graduate from Bangor University this week. As well as graduating with a first class BA (Hons) Childhood Studies degree, Darleen Jones, 39, from Rhosgadfan, Caernarfon also won the Dr John Robert Jones Prize of £1,000, which is awarded annually to the best students across all disciplines at the University. Darleen had worked with children for around 10 years before she applied to study at Bangor University. Her children’s primary school’s after school club was desperately looking for cover, so Darleen stepped in to help, and from then on she has worked in various roles within the childcare sector, undertaking vocational training and qualifications along the way. Darleen explains: “I loved my work, however, it could also be frustrating. The expectations of the early years sector increased, while funding dramatically decreased, and there was no real platform to voice our concerns as to the impact on the children and staff. Additionally, there was limited scope for further training, qualifications and progression within the sector. “I had never considered attending university, however, following a successful Estyn Inspection at the Cylch Meithrin I was running, an Estyn inspector suggested that it was something I should consider, particularly if I wanted to further my career in working with children and young people. Bangor University is our local university and the welcome, support and quality of education that I received there means that it turned out to be one of my best ever decisions. “During my degree, I went on a placement to Barnardo’s Caban Bach Family Centre in Blaenau Ffestiniog, where I was given the opportunity to contribute to mindfulness training for the family support team. The participants initially felt self-conscious about participating, but it became apparent that mindfulness was a powerful tool for the parents, and that it had enormous potential to contribute to their well-being. “Now that I’ve graduated, I’ll endeavour to make a difference to the lives of children and young people by championing their rights. Children and young people in the UK are under a significant amount of pressure. Society places extraordinary expectations on children and young people as they are viewed as the future of society and yet, because of their status as children, they are given very little say in how this will be achieved.